The Paragon Contact Manager is a workflow tool that can be used as a wizard, or manage each information section individually. For this Quick Start Guide the Contact Manager is shown in the Wizard format; however, each section can be navigated to by using the vertical menu on the right side of the page. The Contact Information section will open; there are only two required fields on this page, First Name and Last Name. Once these have been entered, Paragon allows you to save the Contact by clicking Save. The various fields in the Contact Information section are self explanatory. Either click the field you wish to enter information into; or, using the tab key to move the cursor to the field to enter the information. 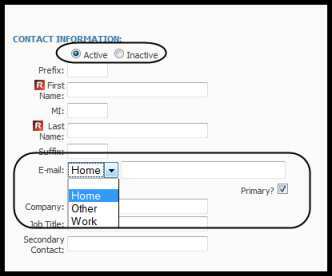 The more complete the Contact information section is filled out, the more useful the Contact manager will become. Active / Inactive status buttons will separate contacts from one group to another. 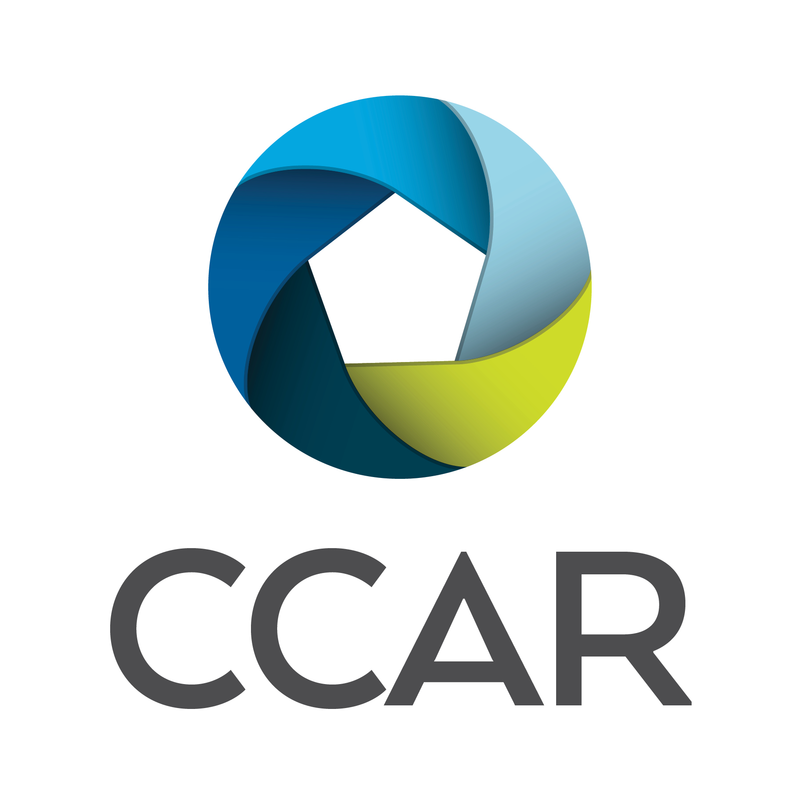 Making a contact Inactive will turn off all automatic notifications, and will deny access of the prospect to the Client Connect site. The E-mail drop down allows you to designate if the email address is Home, Office, or Other. The Primary checkbox assigns which address is the main point of contact. As each E-mail address type is selected, (Home, Work, Other) the address associated with that type will appear in the field. 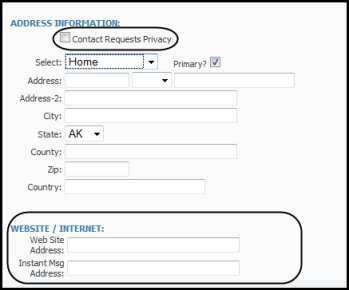 Contact Requests Privacy check box is used to eliminate the contact when mailing labels are printed. Select dropdown designates what the address is; Home, Work or Other. Web Site Address can be used to keep track of any websites the client may have. Instant Messaging Address can be setup to show any IM service the customer may be using, or can show a phone number for texting. Telephone section allows for 4 phone numbers to be saved. Each phone number has its own drop down designation box containing a variety of title choices. 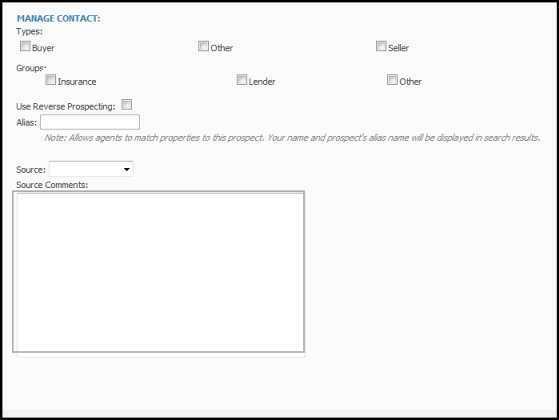 Types allow you to segregate your contacts between buyers or sellers, or any other type your local association has set up. Groups are set up by the user by clicking the manage groups link. Then contacts can be assigned to multiple groups for bulk emailing. For more information to set up groups, or to do bulk emailing by groups see the groups Quick Start Guide. Reverse Prospecting allows the listing agent to look for prospects with saved searches that match their property. The name entered in the Alias field is the only name the listing agent sees, insuring no one knows the contacts real name. For more information on Reverse Prospecting see the Reverse Prospecting Quick Start Guide. Source is a drop down field used to track where the prospect came from. It contains a variety of choices set up by the local association, such as Newspaper, Web, Phone Book, etc. Source Comments allows you to save any information about the source or prospect that can only be viewed by you. Click Save to save all of the contact information. This will also place the contact into the Contact Manager Wizard, which will take you step by step through the contact management process. When the Contact Information is saved, Paragon starts the Contact Manager Wizard. Navigation though the Contact Manager can be done by clicking the NEXT button; or, by using the Vertical Menu located on the left side of the window. In the example below, the NEXT button will take you to the Saved Search page.